From 1841 the Rectors of the church embraced the Oxford Movement which promoted a return to Catholic doctrine, ritual and spirituality. This Anglo-Catholicism was pioneered by the Reverend Frederick Woolley, and still underpins worship at St Michael in Lewes today. 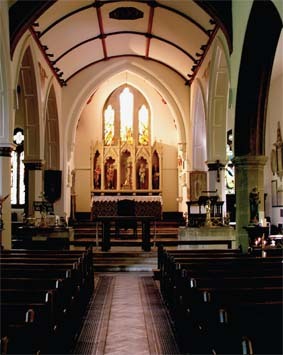 The chancel was extended, and the whole church remodelled, between 1878 and 1891. During this time the additions to the interior included the stepped chancel, the reredos by J. L. Pearson, an organ chamber and organ by the renowned London organ maker, Alfred Hunter, a brass lectern and the stained glass by Henry Holiday.